Bruce Boudreau was the right guy for the job four years ago. Glen Hanlon wasn't getting through to the young Capitals, but in walked the affable Boudreau, with his everyday-man personality, open mind, and an offensive system catered to the likes of all-world talents such as Alex Ovechkin, Mike Green, Nicklas Backstrom and Alexander Semin. 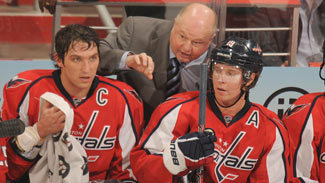 Boudreau's way worked as the Capitals surged under his watch, winning four Southeast Division titles, including the Presidents' Trophy in 2010. But over the last 12 months Boudreau's message and his system had changed. No longer was this going to be the fun-loving, free-wheeling Capitals. No longer were they going to try to put five goals on the board because it would be enough to make up for the three or four they allowed. No longer were they going to rely on the stars, namely Ovechkin, to bail them out. Boudreau was making changes in an attempt to save his team's reputation and, in the long run, his job. One has taken a hit, the other is officially gone, with Boudreau being fired by Washington GM George McPhee on Monday and replaced by ex-Capitals captain Dale Hunter. McPhee couldn't wait another day to see if Boudreau could win back the dressing room and win over Ovechkin again. He couldn't sit back and watch his talented team play second fiddle in its own division, let alone the Eastern Conference. After watching his Capitals underperform in another lopsided loss Saturday night, McPhee had to make a change. The Capitals stopped responding to Boudreau. Washington allowed 31 goals in its last seven games under its now former coach. Taking it back further, Washington was just 5-9-1 in its final 15 under Boudreau. It has the League's 29th-ranked defense (3.27 goals per game), 23rd-ranked penalty kill (80.0 percent) and 17th-ranked power play (16.3 percent). The results are what matter, but they're the byproduct of the meltdown that has taken place in D.C. since the Capitals started 7-0. Boudreau has benched Ovechkin in the final minutes of a tie game, angering the team's biggest superstar, the face of the franchise. It was a bold move and one that spoke to the accountability he was preaching, because Ovechkin has underperformed, but everyone knew it was also a battle the coach was not going to win. Ovechkin has a decade left on his $124 million contract. He isn't going anywhere. Boudreau then made the underperforming Alex Semin a healthy scratch. This was a move he had to make to wake up the sleepy Semin, but it spoke volumes about how a talented player who had previously been one of the Capitals' best had stopped listening to Boudreau. The move didn't work. Semin scored a goal in his next game, but he was a minus-2 over 18-plus minutes in a 6-3 loss to the Rangers on Friday and played only 13-and-a-half ineffective minutes in the 5-1 loss at Buffalo on Saturday. Ovechkin, by the way, was a minus-4 with only two shots on goal in the loss to the Sabres. He has just 17 points in 22 games, and 102 points over the last 101 games. No offense to Jason Chimera, but he's not supposed to be the Washington Capitals leading goal scorer. Boudreau's backers might say a healthy Green could have helped save the coach's job today. The Capitals are 8-0 in games Green plays this season, but that includes the first seven, when the team was on fire, and just seven minutes and 44 seconds of a 3-1 win in New Jersey on Nov. 11. The problem is that while Green might have helped Washington win a few more games in the last month, the clock started ticking on Boudreau's tenure in D.C. long before the star defenseman got hurt for the first time this season. After another disappointing playoff performance last season, a four-game sweep in the second round at the hands of the Tampa Bay Lightning, Boudreau couldn't afford to lose his voice in the dressing room. He couldn't afford to lose the backing of the superstar captain and his buddies. He did, and now he's gone. You might say it's a classic case of the inmates running the asylum, but that's the power star players have. When they stop following, change inevitably occurs. It's Dale Hunter's concern now, and four years later we're again wondering if a rookie NHL head coach can turn around the Washington Capitals.